Many tools in one – time-saving tool for your applique, sewing, quilting, and embroidery projects. Micro Tips – Great for snipping tiny hard to reach places, poking through fabric, snipping tiny tight threads, and even for creating buttonholes. Large Ringed Handles – allow you to get in and out of the scissors quickly and easily. 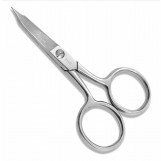 Curved Scissors – allow safe Controlled Cuts for everything from Quilting and Embroidery Crafting, to surgical stitching, and even pet grooming. Our Curved Scissors are greatly used in crafting: Embroidery, Quilting, and other sewing crafts that often involve situations in which scissors with curved blades can be extremely useful for controlled cuts. The Curved Blades help protect your projects from getting jabbed, stabbed, or snagged. Hand Crafted with German stainless cutlery steel with adjustable screw.